The family of a Lanarkshire teenager who was stabbed to death have met with Scotland's top law officer and the Justice Secretary in a bid to change the law on knife crime. Reamonn Gormley, 19, was murdered in February 2011 as he walked home from watching a football match at a pub. Daryn Maxwell, 23, who stabbed the student three times for refusing to hand over his wallet and mobile phone in Blantyre, South Lanarkshire, was sentenced to a minimum of 19 years’ imprisonment in December 2011. 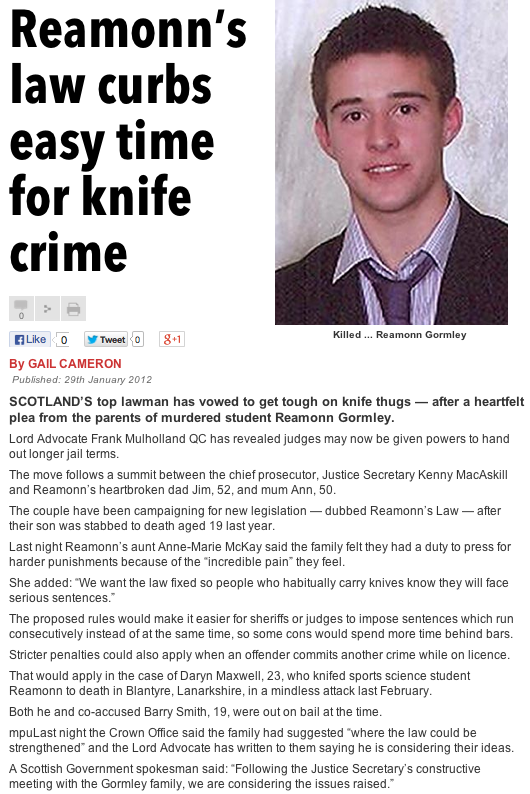 Mr Gormley’s parents Jim and Ann are campaigning for new legislation to allow judges to impose tougher sentences on knife criminals. They have met with the Lord Advocate Frank Mulholland QC and Justice Secretary Kenny MacAskill to secure their support for changes to the rules to allow judges to hand down consecutive sentences for blade offences. At present, people convicted of multiple knife crimes can receive a concurrent sentence that sees them serve all of their sentences at the same time. Consecutive sentences run successively meaning the prisoner spends longer in jail. Prior to the murder, Maxwell had been jailed for a knife offence and then given a concurrent sentence when he was later found in possession of a knife while in prison. The Gormely family believes that, had Maxwell received a consecutive sentence, he would have been in prison and unable to kill their son. Their campaign also calls for mandatory custody with no bail for frequent knife criminals, for knife crime to be punished as an aggravated offence, and for the establishment of a sentencing quango to ensure tougher punishments. Jim Gormley, whose 19-year-old son was stabbed to death in Blantyre last year, said an announcement that the maximum sentence for carrying a knife is to increase by one year to five years will do little to deter habitual criminals. He also hit out at an announcement by Justice Secretary Kenny MacAskill that amendments will be made to existing legislation making it clearer to sheriffs and judges they have the power to impose a consecutive sentence on offenders who commit crimes after being released early from prison. The changes, which will clarify the powers available to the judiciary, are aimed at ensuring more offenders complete their original sentence before starting a new one, rather than serving them concurrently. Mr Gormley said it "beggared belief" that the legislation to do this is already in place but is not fully understood or being fully implemented. He said: "To me, MacAskill is just paying lip service here. If they were really serious about tackling knife crime then they would introduce measures to really make people think before they carry a knife. For habitual criminals and people like Daryn Maxwell, who murdered my son, they'll not be put off by another year. It really makes no difference to them. "And this is only a maximum sentence – how many people are actually given the maximum sentence?" Mr Gormley added: "As for clarifying legislation on concurrent sentences, it begs the questions why is it not clear, and exactly how up to speed are our judges if they don't know it's available to them and how to use it? "To me, concurrent sentencing should be completely scrapped. Why should someone be able to commit two crimes and only serve one sentence? "We met with Mr MacAskill and the areas we wanted him to look at were the length of different terms in jail, concurrent sentences and bail. We wanted action on bail and accused people being released on bail despite having numerous previous convictions or outstanding cases, but as far as I'm aware nothing has been done on this." A Government spokesman said existing legislation on concurrent sentences was old and in need of updating, something the Government was already looking at. The maximum sentence for carrying a knife in city centre areas increased from one year to four in April this year in response to calls from the Gormleys and other campaigners. Mr MacAskill announced the latest increase to five years at a Violence Reduction Unit event in Glasgow yesterday.